Every heard of Everspace, the new game from the creators of Galaxy on Fire? It’s such an interesting concept with no real way of defining it into the gaming known genre. Is it an MMO or just a predefined adventure? Maybe a multiplayer space sim or even a bit of hint of arcade adventure… Everspace is just a space roguelike in 3D instead of the usual 2D sidescrolling genre. For those of you who never heard of the game, Everspace is easily compared to titles like Star Citizen or Elite Dangerous, which are actually different from the root of the gameplay. While you might find the typical first or third player view spaceship cockpit easy to compare to Elite Dangerous, the entire control scheme is different, where you can freely move up, down, tilt, strafe, and more, almost like a FPS or 3PS shooter in space. To start, let’s point out that this is a singleplayer space shooter with rogue-like mechanics. Well done via a rather simple but interesting storyline, supported by beautiful cinematics and your ship’s AI assistant (which has its own humor and personality), the game starts by tossing you in the wilderness of Everspace without knowing why, except that you are fleeing from dangerous pursuers, and your progress in the adventure will allow you to gradually regain your memory and understand the real reason behind this cat and mouse game. 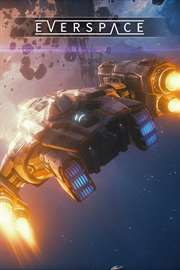 structurally, Everspace is composed of different phases of gameplay that are pretty much in the same cycle of an MMO for example, following , with a whole “exploration, loot/harvest, craft/upgrade” sequence, to be ready for combat. And so Everspace will propose seven different stellar sectors to explore, each offering its own set of missions in which will alternate between exploration or just combat battle phases. On that note, you gotta be careful not to linger too long in the same level, as galactic “patrols” will finally catch up to you, which in most case will end up with your life at risk. Exploration is often rewarded in Everspace, and the various missions will allow you to get better equipment, but also resources and money, in order to improve your ship in a consistent way. Far from being just cosmetic, this customization will be necessary if the player wants to be able to face the greatest dangers of Everspace and enemy fleets, as the challenge is quick fair, even in normal mode. Thus, you can choose your ship class from among three available (the first one is free, the other 2 need to be unlocked), and can after that modify many elements, such as the types of primary weapons (lasers, machine guns, etc) or secondary weapons (like different types of rockets), not to mention your core gear like shield, life support and support drones. In addition, every piece of equipment can be upgraded if you have the necessary resources. Due to its rogue-like nature, each of your death in Everspace will make you start all over again at the beginning of the adventure, but keeping your core improvements intact. These type of improvement will take the form of a skills tree, which will improve your given skills, ranging from armor resistance, speed, critical hits, and more. In terms of playability, Everspace is on point, offering a gameplay style much more accessible than the like of Elite Dangerous, opting for an extremely dynamic control scheme. In addition to the choice between first and third person view, the game relies on a classic handling (direction / altitude / acceleration / dodge) and the sensations of speed are great. Plus the well-created tutorial teaches you the basics of gameplay, and you will quickly learn how to master your ship, dashing at full speed, dodging debris, and dog fighting enemies like a space Top Gun. Finally I’ll end this review by mentioning the technical and artistic part of the game which is pretty great even on console. While some textures lack details, the environments as a whole, the variety of enemies encountered, and the environmental effects smack are well done. It’s almost putting other AAA games from veteran publisher to shame! Everspace was reviewed using an Xbox One digital copy of the game provided by ROCKFISH Games. The game is also available on PlayStation 4 and PC via online stores. We don’t discuss review scores with publishers or developers prior to the review being published. With Everspace, ROCKFISH Games gives us a well-done and dynamic space shooter, enhanced with rogue-like elements giving the player with a persistent goal to get better. Visually sublime, accompanied by a great story, Everspace is a must single-player experience on either console or PC.